I stumbled upon this on Twitter, I’m not sure who it was who linked it, but it caught my eye. Wikipedia is an amazing tool for everything from answering trivia questions, to researching university papers to wasting time to closing arguments to trolling. But it looks rather tired and the interface has not changed in appearance since, I am led to believe, it was launched. Like you, we’re huge Wikipedia fans! In fact, who isn’t? Wikipedia is the greatest curator of human knowledge, allowing people all around the world to freely access over 30 million articles. The only problem? Wikipedia was built 13 years ago – and hasn’t changed much since then. That’s why we’ve created Wikiwand, giving good old Wikipedia a great new look. Wikiwand is a modern interface for web and mobile, that optimizes Wikipedia’s amazing content for a quicker and significantly improved reading experience. Fortunately, all articles on Wikipedia are released under a free license, which allows us to fetch Wikipedia articles and optimize them for maximum readability and enjoyment. At Wikiwand, we’re all about providing you with a better, easier access point to the world’s knowledge. We hope you enjoy the result! The new interface looks very slick and modern. 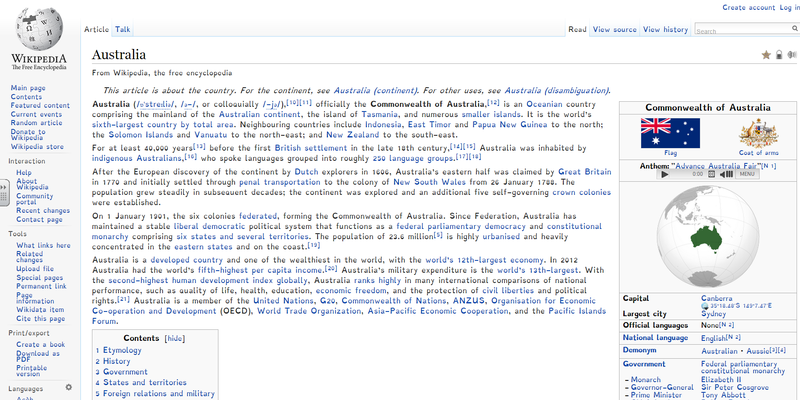 The cumbersome page menu, which traditionally can take up a substantial amount of space on a regular Wikipedia has been shifted to a static sidebar, allowing you to access it to jump around within a page. To give you an example, take a look at the two images below. 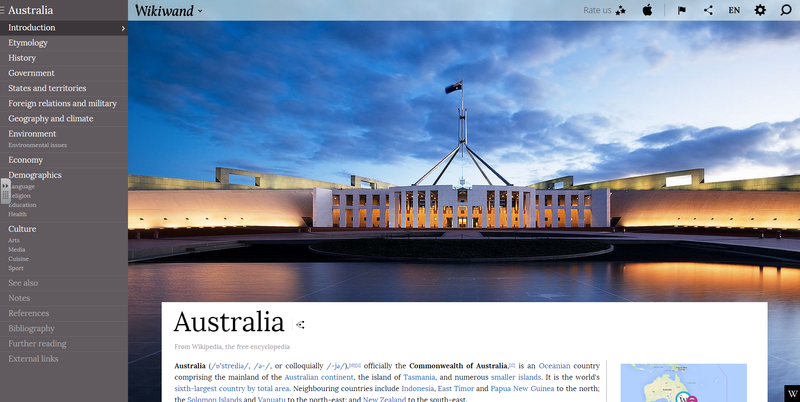 The first image below, is from the traditional Wikipedia page on Australia. I utilise the Dyslexie font because I find it easier on the eyes, but even so, you can see that the structure and look of the page is rather staid and boring. You can see the difference. The Wikiwand version is cleaner in appearance, in organisation and ease of access yet acknowledges its roots in Wikipedia, with each page containing the words From Wikipedia, the free encyclopedia underneath the page title. There are some additional features that make it feel modernised. Many images on any given page, when you hover over them feature a call out, of two arrows pointing towards opposing corners of the image. Clicking on that call out opens up a gallery of all images on that page allowing you to view them in greater detail. The Google Chrome extension, Clearly works on WIkiwand, however I’ve not been able to ascertain whether the extension tl;dr works or not as the extension itself seems to have stopped working recently. It is available as an app on both apple and Android devices (though Android is currently early invite only), and it looks excellent on the app as well. The only criticism I would level at it at the moment, and it is not a big issue as I believe that with time it will happen, is that it has not yet been applied to the Simple Wikipedia site. If the developers are able to do that, that would be a huge benefit to teachers and students everywhere, I believe.